On View> MoMA Presents "Frank Lloyd Wright and the City: Density vs. Dispersal" - Archpaper.com On View> MoMA Presents "Frank Lloyd Wright and the City: Density vs. Dispersal"
Frank Lloyd Wright and the City: Density vs. Dispersal will represent the first exhibit resulting from the recent join acquisition of the architect’s archives by MoMA and Columbia University’s Avery Architectural and Fine Arts Library. The models, drawings, and films found within the extensive collection will allow the museum to illustrate the tension in Wright’s urban thinking in the 1920s and 30s. 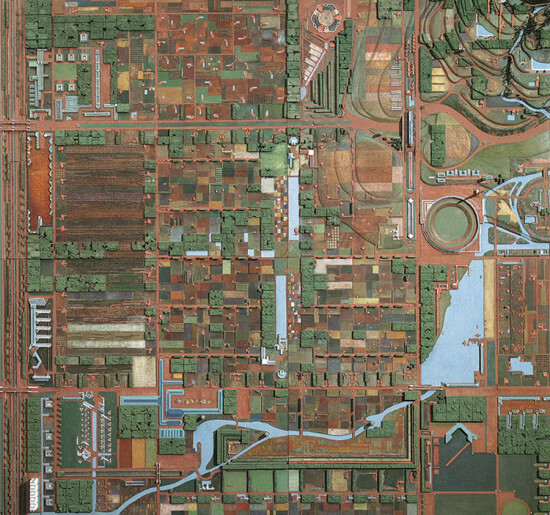 Even as he undertook projects that contributed to the increasingly vertical nature of American cities, he created a radical horizontal vision of urban life known as Broadacre City. The elaborate model of this agrarian metropolis created by Wright and his students will be displayed alongside the architect’s designs for the San Francsico Call Building, Mahattan’s St. Mark’s-in-the-Bouwerie Towers, and a largely theoretical mile-high skyscraper.